Over time garage door springs wear out, they make the door move poorly and, eventually, they break. This can be dangerous because the garage door is very heavy and can slam shut on someone. All garage doors function by the use of tension from springs. The parts are expertly designed pieces that have the flexibility and strength to allow the garage door spring to lift the heaviest doors. The garage door springs also allow automatic openers to work with ease. As stated before, springs can be hazardous and can require special equipment to be replaced. Broken spring repair is really left up to the experts that are easy to find in Auburn, WA. There are two major kinds of garage door springs, extension springs and torsion springs. Sectional garage doors, the type that has multiple sections that fold when the door is closed or opened, use torsion springs. Torsion springs are installed right above, where the door opens, going lengthwise on the top of the door. Just one torsion spring is enough for one car garages and two tension springs are used in two car garages. Reliable service provider for residential garage door repairs. For the torsion spring to be able to function correctly, it is installed with very high amounts of tension. This is why it is important to find an Auburn garage door professional to replace a broke garage door spring of this type. There is enough force in a tension spring that it can seriously injure a person and even death can occur, if the person replacing the broken garage door spring is not trained properly. Most galvanized garage doors have torsion springs. Garage doors that tilt up are going to have extension springs installed. These doors consist of just one section that goes up and in, when it is opened. There are extension springs on either side of the door. Extension springs function by stretching and then recoiling to pull the door up. Older model wood garage doors often have extension springs and, due to age, can be tricky to fix. When one spring breaks, it is better to go ahead and replace both because the second one is not far behind. Also, the tightness of the new extension spring can actually cause the older one to wear out fast. This is all something you will need to discuss with your Auburn, WA, garage spring replacement professional. 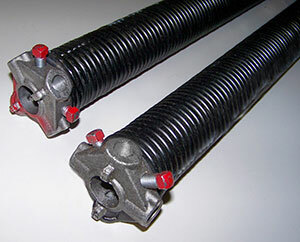 There is a new kind of torsion spring being used by Auburn, WA, garage door spring professionals. The Torque Master plus has a one of a kind system that keep the spring protected inside a tube made of galvanized steel. This system is going to be safer because it removes the danger of exposed torsion springs. This type of garage door spring is also quieter and better to look at. They come per-lubricated, leaving the need for less maintenance. Torque Master plus works like any other torsion spring, but it can also prevent accidental dropping of the door, if the spring breaks. This safety system will stop a heavy door in its tracks before it can harm any member of your household, visitors, or even pets. The door can simply be raised a couple inches and control is regained. Once again, it is better to allow an Auburn professional garage door replacement expert install this spring because it only works properly, when it is installed correctly.